Toddlers are most adorable little creatures, especially when allowed to explore their talents. 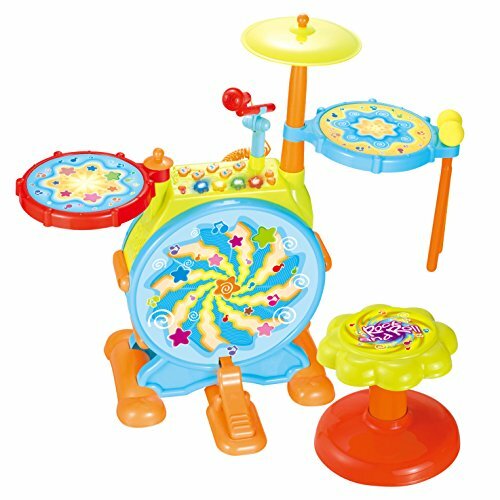 Drum kits have been known to provide endless hours of enjoyment, so why not buy one for your toddler? 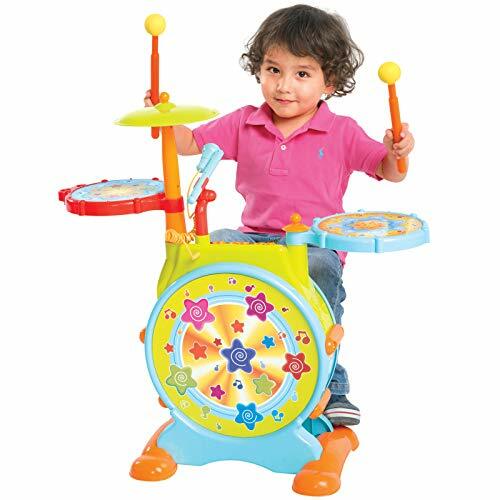 A drum set is the perfect way to encourage your toddler to take up music at an early age. But how do you know you choose the best toddler drum set? In this post, we explore the best toddler drum sets on the market and teach you how to make the right choice for your baby. But first…what are the benefits of drum kits for toddlers? Babies can hear different sound types from an early age. They can differentiate their mother’s voice from the rest just a few weeks after birth. Exposure to drums enhances your toddler’s ability to decipher sounds. Let’s face it…what parent doesn’t like lulling their baby to sleep with a lullaby? In addition to soothing children, drums can go a long way towards boosting their mood. Playing drums, like textures and taste, aids sensory development in children. Learning percussion helps create more pathways between the cells in your child’s brain. 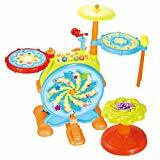 A great way to improve your child’s coordination is to get him a toddler drum kit. Even if he doesn’t understand the music he plays, he’ll certainly move to its rhythm. Dancing to the music not only encourages development of motor skills, but also helps with muscle strength, development and balance. 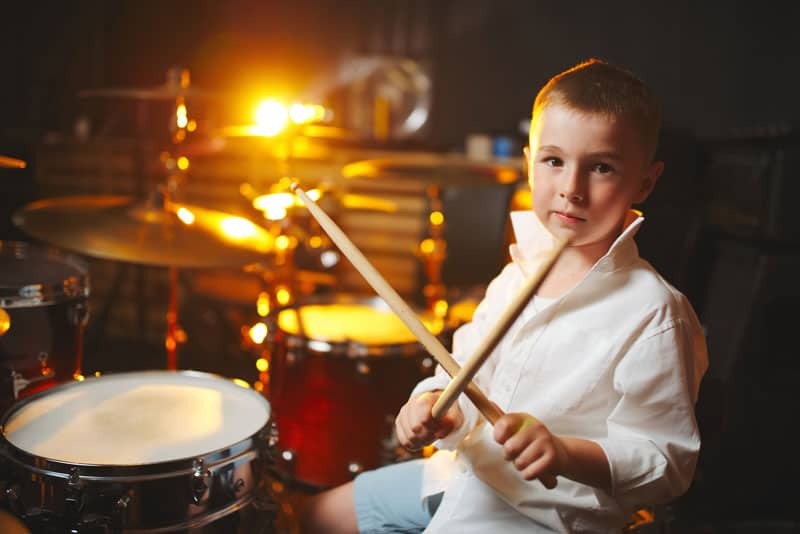 There is no limit to the number of skills your child could develop as a result of playing drums. And what’s even better is that these skills in turn boost his confidence and help him succeed later on in life. Now that you how valuable a toddler drum kit is for your little guy, let’s look at the top 10 options on the market. 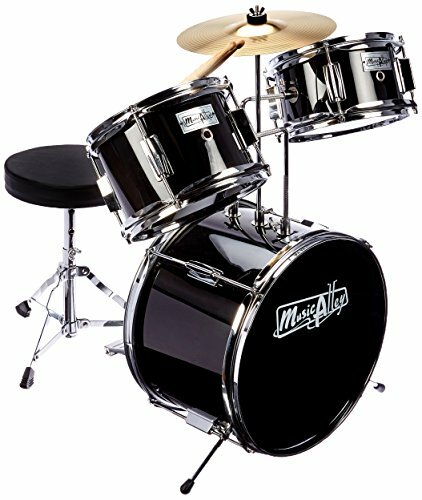 Topping our list is this 3-piece drum set from Music Alley. Designed for kids aged 3-7 years, it is incredibly affordable and comes with everything you need to get started. It has great style, and is suitable for both beginners and more experienced drummers. You get three drums, including a bass pedal and two hanging tom toms. Music Alley also includes a pair of drumsticks and a padded stool to ensure your kid is comfortable. Both drumsticks are wooden and finished with kid-safe materials. Setting up the drum kit is easy, thanks to an instruction manual provided by the manufacturer. In addition, it is lightweight and you can easily dismantle it for storage or transportation when necessary. The Music Alley Kids 3-Piece Beginners Drum is a great choice for any parent who wants to nurture their child’s musical talent from an early age. It is made to last long with real wood and chrome hardware. This is one of the things that sets it apart from other kits made from plastic. Additionally, there are colors to choose from. The V-Tech KidiBeats Kids Drum Set is more than just a great tool for making music. It also helps toddlers aged 2-5 years learn letters and numbers. While designed as a toy drum set for kids, it is effective for helping your child learn the skills required to handle two drumsticks. It comes with nine built-in melodies that your little can play along to if he doesn’t want to freestyle. They are of different genres including rock, dance and pop. What we love most are the lights, which turn on to indicate where a toddler should hit to make music. 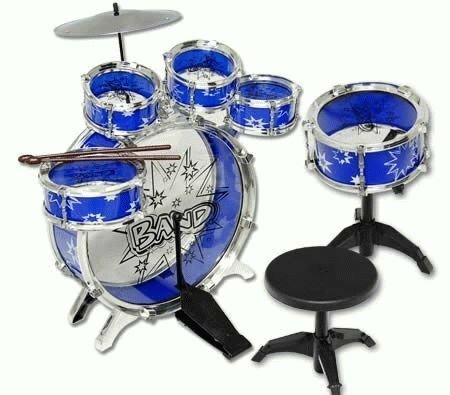 While crafted from plastic and small, this drum set ticks all the right boxes for the intended age range. It offers a variety of developmental benefits such as sensory development, musical creativity and improved memory. Judging by the 2000+ reviews from parents, this set is fun and engaging for younger kids. Coming up next is the IQ Toys My First Drum Set, which is designed to help your toddler hone his skills while playing his favorite tunes. It includes everything your child needs to explore the drumming experience. Its lightweight design makes it easy to set p, dismantle, store and transport when necessary. This kit allows a variety of ways for your child to play with four modes i.e. a Pedal and Microphone, Numbers and Colors, Drum and Cymbals. It also comes with three dance beats, five cheerful tunes and ten snippets of favorite songs. Talk about a broad selection of sounds to play along to. And if you little one feels like exploring his creativity, he can freestyle! The IQ Toys My First Drum Set includes three drum pads and cymbals. Each of them has its own sound, which is a crucial factor that helps with sensory development. You also get a chair to ensure optimal comfort during jamming sessions. The drum is about 24” while the stool is 8”. This is the perfect height combination to ensure that your child doesn’t struggle when drumming. The set is made from sturdy plastic and lasts a long time. This 12-piece drum set for toddlers is the perfect pick for jazz lovers. If your child loves music and you want to hone that skill from a young age, the Toyvelt 12-Piece Kids Jazz Drum Set is a good contender. It includes everything your child needs to get started and more i.e. a comfortable kick pedal, a cymbal, 5 snare & bass drums, stool, 2 drumsticks and a cymbal. The set is realistically made with durable plastic, thick hardwood and chrome rims. This eliminates the worry of breakage and ensures longevity. The bright blue color pops in the room. This kit is lightweight, hence easy to set up or pack up for storage and transportation. 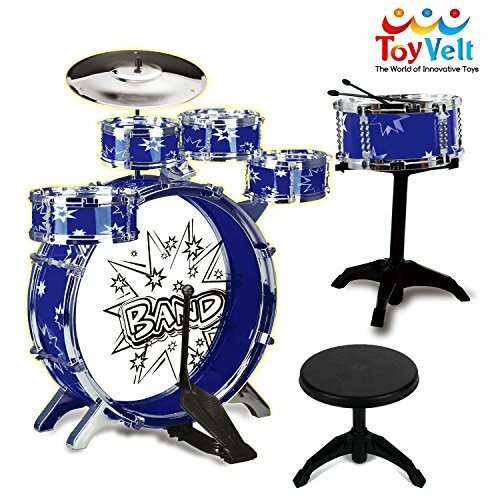 The ToyVelt 12-Piece Kids Jazz Drum Set does more than just nurture musical talent. It is both educational and fun. Playing jazz on this kit helps toddlers improve hand-eye coordination, develop motor skills and enhance creativity. Their performance and cognitive skills also improve considerably, and these come handy when they are older. 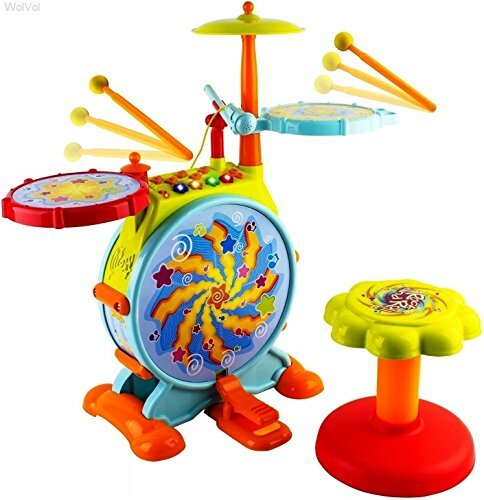 Designed for 3+ year old kids, this drum set is backed by a 100% money back guarantee that ensures complete satisfaction. 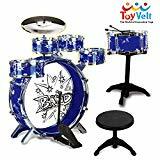 The WolVol Electric Big Toy Drum Set for Kids is best recommended for 1-2 year olds. It is the perfect gift for a little girl who needs something fun to play with or express herself. It offers multiple ways to play, allowing your child to become more creative and improve hand-eye coordination. Assembling the WolVol Electric Big is pretty easy, and so is packing it up for storage or transportation. The kit includes a cymbal to bang on, two drums, and a kick drum. The stool allows your kid to sit like a professional during jamming sessions, while the fully functional microphone ensures she can sing along to her favorite tunes. There are different modes to explore including melodies, songs, beats and music. The colorful lights take your sessions to the next level. The 8” stool provides plenty of comfort and is great for the average toddler. This kit is constructed to last a long time using durable plastic and has bright colored patterns. If you want to give your little one a fun and memorable drumming experience, consider the Best Choice Products Kids Electronic Toy Drum Set. It features a functional microphone for blaring vocals, left and right snare drums, a bass drum and cymbal. Made from durable plastic, this drum set is designed to last long and doesn’t break easily. It is easy to set up and once disassembled, it’s small enough for compact storage. The volume adjustment buttons make it easy to play in both noisy and quiet environments. It offers several ways to play with 5 buttons that play different background music. There are four light up buttons for modifying sound effect, hence more creative ways for your little one to explore their musical talents. You also get two drumsticks and a sturdy stool so that your child can jam like a real musician. The microphone comes handy for toddlers who love singing along to their favorite tunes. Three AA batteries are required for continued use. 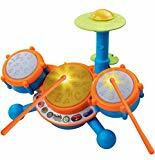 This is an award winning toy drum set for toddlers that takes the drumming experience to a whole new level. Unlike other battery-operated kits on this list, the Hape Rock and Rhythm Kid’s Musical Instruments Wooden Drum Set goes old school. This ensures that your kid indulges in the joy of drumming without distractions. It does not have built-in melodies and tunes, and this is a huge advantage for parents who want their kids to discover in their own way. It comes with everything needed to get started including drums, rhyme makers and drums. This is an excellent gift for children aged 36+ months. It is realistically made with child-safe materials and finishes. 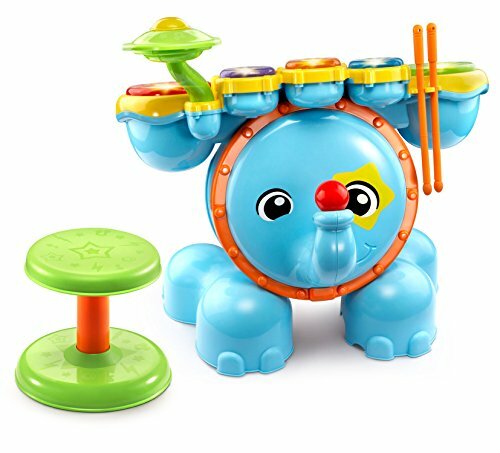 In addition to enhancing musical skills, this toddler drum set also helps with hand-eye coordination, dexterity and creativity. The YMCToys 11-Piece Boy Girl Musical Instrument Toy Playset is another one of our favorite drums for toddlers. Available in blue and red, this kit comes with everything you need to get started including drums, cymbals and drumsticks. It is built to last a long time with ABS plastic, aluminum and non-toxic paint. You don’t have to worry about breakage. The metallic hardware complements the blue nicely. The bass drum has a 14” diameter while the chair is 10”, a perfect combination for average toddlers. This fun drum set includes one snare drum, one bass drum, one bass drum pedal and four tom toms. You also get two drum sticks and a comfortable stool. And while it is a little pricey, the professional drumming experience is worth every penny. VTech is known for delivering quality baby equipment including monitors, learning boards, and tablets. Their Zoo Jamz Stomping Fun Drums are incredibly popular among kids and for good reason. It is a toddlers’ drum kit made from durable plastic that is perfect for nurturing musical talent. It comes complete with drum heads and cymbal that light up when tapped. This helps enhance pattern recognition and development of motor skills. Stepping on the bass pedal moves the elephant trunk back and forth, triggering the sound effects. There are four game modes such as Catch the Lights, Free Style, Counting and Follow the Leader. These modes are a great way for your child to explore their creativity while having a good time. Also included are 16 melodies and six songs that your toddler can sing along to. In addition, he can either create his own beats or take advantage of the four drum styles. The bass drum and pair of drumsticks are good for improving coordination. 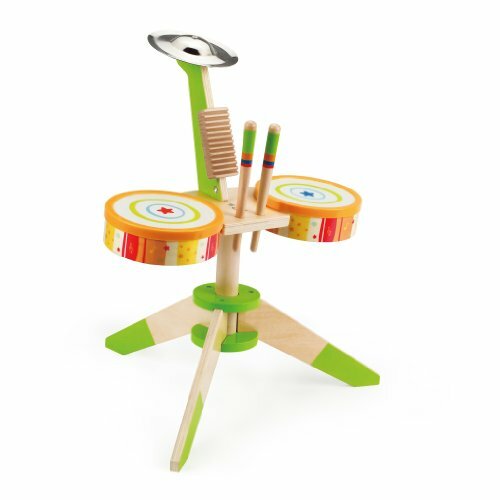 Concluding our list is the B/Toys B. Drumroll Drum Set, an interactive kit that comes with seven percussion instruments to get your kid started. It is a portable parade kit that sets up and dismantles easily for compact storage. With every purchase you get one toy drum, castanets, one shaka egg, one whistle, a pair of drumsticks and one tambourine. It offers the old school drumming experience, ensuring your child can explore their talents without relying on modern technology. All the seven musical instruments fit inside the drum for storage and transportation, hence a perfect kit for travelling families. 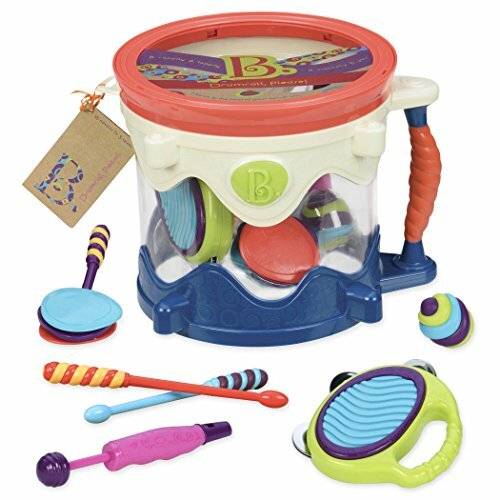 This sensory toy drum set for toddlers has bright colors, varying textures, twisty handles, knobs, as well as bumps and bruises to stimulate your child. It is completely safe for children thanks to phthalates- and BPA-free construction. Drum sets come in all shapes and sizes. They are also made from different materials. Depending on what you are looking for and the budget, you can get drums for beginners, professionals and everything in between. So how do you know you’re making the right decision, particularly when purchasing drums for a toddler? Regardless of what you may think, adult and kid drum sets are not the same. For starters, the price of toddler drum sets is a clear indication that they are not of the best quality since they are designed to be fun toys. Construction also differs greatly between adult and kid drums. Cymbals and foot pedals damage easily after repeated use while thin drum heads on toddler drum sets require replacement after a while. The biggest difference is the size – children’s drums are unsurprisingly smaller than those of adults. Another crucial factor to consider when making any purchase is how much you’re willing to spend. While considerably cheaper than adult drums, the cost of toddler drum sets varies depending on multiple factors i.e. materials, brand, number of pieces etc. Some cost as low as less than $100 while others come at $1000+. Finding the right balance between cost and quality can be tricky, especially when better quality comes at a higher cost. Decide on your budget range, then get the highest quality you can afford. Toddlers are creative souls and need equipment that match their curious nature. You can opt for toy drum sets designed for kids less than 6 years. Most models come with age recommendations, so be sure to check for this. Many toddler drum kits cost less than $150. Be on the lookout for things like built-in sounds and special effects as well as educational features that toddlers find fun. The most drum sets come with a snare, one tom and a kick drum. Kits with more pieces may include extra tom toms and snare drums. Because your child is just getting started, don’t worry about getting more drums. It’s best to start with a 3- or 4-piece drum kit. You should also pay attention to the accessories included i.e. stool, drumsticks, cymbals, cymbal stands, and kick pedal. Some of these can be bought separately, so keep that in mind when looking at the price. While very noisy, an acoustic drum kit offers many benefits. He gets a real feel for the instrument and learns to appreciate authentic sound. On the other hand, electric drums take up a smaller space and are easier to transport. They can be plugged into a computer for recording and one can use headphones in quiet environments. Your choice between the two really comes down to personal preference and what you are willing to forego. Even the most basic drum sets for toddlers require some floor space. Decide where the kit will be used in your used. You can settle on the guest bedroom or garage. Consider placing a thick carpet underneath the kit to prevent sliding and absorb some of the sound. Perhaps the most important safety precaution when it comes to pink drum sets for toddlers is to ensure your kid is ready for one. Kids as young as 1 year can learn to play drums. But just buy the kit and leave them to handle things on their own. Hang out with your toddler and show him the basics. Teach him how to hold the drumsticks so that he doesn’t harm himself in future. It is also important that you set up the kit properly. Loose or falling parts can cause injuries and destroy the experience for your child. Read the manufacturer’s guidelines and adhere to them. Personal discretion is okay, but it shouldn’t come at the cost of your child’s safety. Whew! I have to admit – there is so much to learn about drums and we couldn’t cover it all if we had a week. There are many things your child will learn while exploring these percussion instruments. This comprehensive guide on best toddler drum sets has covered the most burning issues, including factors to consider and the top options on the market. Key things to keep in mind during your search include your child’s age, budget range, number of pieces in a kit and available space. You also need to ask yourself if your kid shows genuine interest in drums. Take care not to purchase a drum that’s easily destructible or your child will grow out of quickly. Learning to play is an exciting experience for children, especially since it allows them to channel their creativity. A kit that includes everything they need to get started and someone to steer them in the right direction is crucial. We hope you find the perfect gift for your little drummer.